Comments: Evergreen, native to coast ranges from Oregon to California. This the California state tree. The redwood perpetuates itself by sprouting. 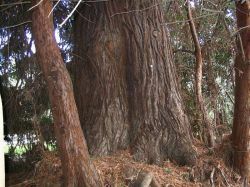 After a fire a redwood tree often sends out sprouts around the base of its trunk, forming the redwood rings which are so common in the sequoia forests. This is the largest specimen in our area.